Additional login prompts are often the result of incorrect authentication settings. For RSA SecurID two-factor authentication interoperation with a Client Access Server (CAS), the owa virtual directory must have Integrated Windows Authentication enabled and Anonymous Access disabled. Launch the IIS Manager (Start/Run/inetmgr). Navigate to Web Sites\ Default Web Site\owa. Right-click on owa and select Properties. Under Authentication and Access control click Edit. Uncheck the Enable Anonymous Access option. Check the Integrated Windows Authentication option. Restart the IIS service (Start/Run/iisreset /noforce). If further login issues occur, we recommend contacting the RSA support team. Open the EMC and navigate to Server Configuration\Client Access and click on the Client Access server. Right-click on the OWA folder and select Properties. Under the Use forms-based authentication option, select User name only. 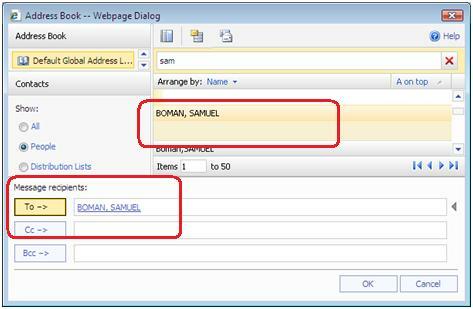 Enter the domain name in the logon domain field. Reset IIS by running iisreset /noforce from the run command prompt. The document cannot be converted by the WebReady Document viewing service because it is larger than the maximum size limit set by the administrator for your organization. When you open an attachment, rather than view it with WebReady Document Viewing or save it to a specified location, the attachment will always be saved to the temporary internet files folder on the local computer. This happens unknowingly to the user creating a real danger on computers where unauthorized people could get hold of confidential documents. Although limited to 4 file types (Microsoft Word, Excel, PowerPoint, and Adobe PDF), this option is more convenient than the first. This is a good option if your company is okay with users saving files to local machine and possibly forgetting to permanently delete them. How can I see my mailbox size and how much space I have? Hover over your mailbox name to see the mailbox size and used portion. If the quota is reached, you must free up some space to send more email. Why is OWA defaulting to the Light version even though I did not check the option on the logon page? Login to OWA and click on the Options link at the top right side of the page. Under the Accessibility heading verify if the accessibility option is checked. Are other people in the company having the same problem or is it only happening on your computer? What browser are you using? Remember that only Internet Explorer 6.0+ uses the Premium OWA version. How can I turn on the reading pane in OWA? You can choose to view messages on the right side or at the bottom. In this example, the reading pane is showing on the right. How can I change the OWA language? When you first login to OWA you are prompted to select a language and a time zone. You can change these settings after accepting you initial settings by going to Options -> Regional Settings. You can change your language and time zone settings from there. Remember to save your changes for them to apply. My fonts toolbar is missing in my new message compose form, how can I get it back? In the new message, check the top-left hand corner to see if you have “Plain text” selected. The “Plain text” option gives you just that – plain text, no fonts, color or highlight options. To get the fonts menu back, just change the drop-down menu to HTML. To change the default message format either to “Plain text” or to HTML (default), go the OWA Options page and from the Messaging section scroll down to the Message Format section. 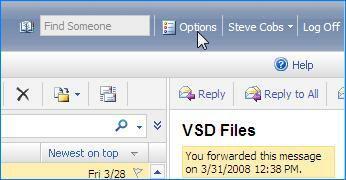 In OWA, click on the Options button at the top left hand side of your Inbox. Choose the Messaging heading on the left menu (default). Scroll down until you see the heading E-mail Signature. To include your signature in each email, select Automatically include on outgoing messages. Press the Save button at the top of the page to save your settings. Spell check options are set in the OWA Options page in the Spelling section. Under the Spelling Options and put a check mark beside Always check spelling before sending. Remember to Save the changes. To log off your OWA account, click the Log Off ( ) button at the top right-hand corner of the OWA window. You can also sort your emails by right-clicking on the column bar to bring up more options, as shown in the screen capture below. Can I change the colors of my OWA window? Scroll down until you see the Appearance section. Use the drop down menu to select the color scheme. Save your changes, before refreshing your browser, to set the new scheme. This will bring up a new message window where you can type into the To, Subject and Body of message. The steps below will take you through setting up your out of office message. Go to the options page by pressing the Options link at the top of the page. From the left menu select Out of Office Assistant. To turn on the out of office assistant, select Send Out of Office auto-replies. Select Send Out of Office auto-replies only during this time period to set your out of office start and end date and time. Fill in your message under Send an auto-reply once to each sender inside my organization with the following message:. To send an out of office reply to people outside your organuization, select Send Out of Office auto-replies to External Senders. Choose Send Out of Office auto-replies only to senders in my Contacts list or Send Out of Office auto-replies to anyone outside my organization. Type your exernal outlof office message under Send an auto-reply once to each sender outside my organization with the following message:. If you are trying to send an email to multiple people, you can start by opening the address book from the To button. The Address Book will open in a new browser window. Search for the first person using the search field at the top, click on the name, you can select multiple names when you hold down the Ctrl keyboard button, and then press the To, Cc or Bcc button to the bottom. The address book will remain open and let you continue with your search until you press Close. Below is how the Plus Pack address book looks. Press the Save button at the top of the page. How can I find someone in the OWA address book? Next, choose the Address Book the person is in. You can do this on the top left hand side of the address book by clicking on Default Global Address List or the contact folder near the bottom. You can also see more address books by clicking on the Show/Hide other address lists link. If you are looking for someone in your personal contacts, the personal contact folders are under the default Contact folder circled in red below. Type in the person’s name in the search field and press the search button. To add the person to an email, click on the name one time and then press on the To, CC or BCC button at the bottom of the address book. How can I get my calendar to show in 15 minute increments? In the OWA Options page, select Calendar Options and under the Calendar Options heading choose the increment, 15 or 30 minutes. This option is only available in OWA Premium; when connecting to OWA using Internet Explorer version 6 and higher. How can I view non-sequential days on the OWA calendar? In OWA, open the calendar folder view. Hold down the CTRL keyboard and click on the dates you want to view. The calendar days will open side-by-side. How can I change my response to a meeting request? Press on the Accept, Tentative or Decline buttons to send your response. You can customize the work week in the options folder along with the time when the work day starts and ends. In OWA, go to the Options page. Click on the Calendar Options heading on the left side. Scroll down to the Calendar Work Week section in the right frame. Press the Save button at the top of the options page to save the settings. Which file types can I use the Open as web page option with? Files not supported by the attachment viewer can be opened or saved. WARNING: After opening or saving file, remember to permanently delete the files from the computer and the local internet cache to make sure they are not left behind for someone else to read. There is a third part solution, AttachView from Messageware Incorporated, which lets you view over 300 file types. AttachView has extra security features letting Administrators turn the open, save and print options on or off depending on where you are connecting from. For example, if you are on your laptop you can save, open and print attachments but if you at an airport kiosk you can only view the file. Why can I not open attachments, I can only save? Your Administrator has likely disabled the Open option because of the security risks associated with this function. When attachments are opened a copy is saved in the local computer, accessible to anyone who accesses the computer, even after logging off OWA. OWA 2007 offers document viewing, called WebReady Document Viewing, which is a safe way to read a document without downloading it onto the computer. The attachment us turned into a web page and displayed in the viewer. You can view 4 document types: Microsoft Word, Excel, PowerPoint, and Adobe PDF. There is a third-party called Messageware that extends attachment viewing to over 380 file types. How can I attach a file to my email? To attach a file to a new message press the attachment icon shown below. This will open a small window which lets you Browse the file system to find your file. When you have found the file, click on it once and the path will be visible on the brows line. To attach the file to your message, press the Attach button. The file will now be visible in the new message. Does OWA log you off even if you do not press the logoff button? Logon to OWA and without logging off, type www.outlook-web-access.com in the browsers address bar and press enter. Now press the back button and notice that you were not prompted for your username and password to get back into OWA. Now imagine this happened at a public computer.